Cardiac Directions® delivers educational materials to newly-diagnosed heart and stroke patients who are enrolled in cardiac rehabilitation classes, as well as through community outreach programs conducted by local hospitals, and in cardiologist's offices. Your brands' marketing materials are personally distributed to patients by a medical professional, which provides an implied (if not explicit) endorsement for participating brands. Consumers who are concerned about their cardiovascular health are undergoing changes in diet, exercise, medications and overall lifestyle. The habits of a lifetime are being carefully re-evaluated at this important time. Consumer Education: Many hospitals conduct community outreach that includes heart health screenings to identify at-risk individuals, coupled with educational sessions (using Cardiac Directions materials) to help inform attendees about heart-healthy lifestyles. See how three different hospitals proactively educate their community about heart health. Cardiac Rehabilitation: Hospital-based cardiac rehabilitation programs have used Cardiac Directions materials since 1993. Cardiac rehabs combine intensive education and exercise plans for patients who have already experienced a heart problem, to help them modify the risk factors that led to their condition. 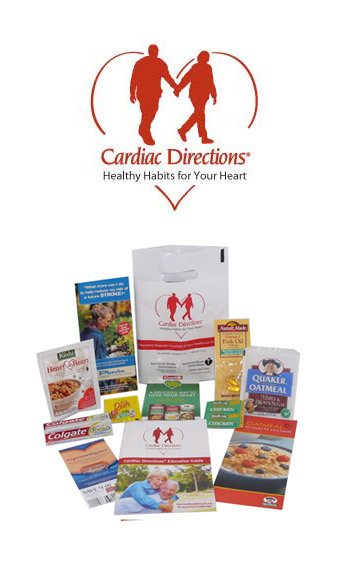 Cardiac Directions materials include advertising within a full color digest-sized Education Guide, product sampling, healthcare professional communications, as well as the delivery of preprinted brand literature and coupons.